Has there ever been such a sudden, passionate love affair between a city and a newcomer as that between Madrid and James Rhodes? The pianist-writer moved to Spain last year with an armful of hit classical albums, two bestselling books and a dodgy command of the Spanish language. A year later, the frizzy-haired musician is the toast of the town. He writes opinion articles in the Spanish press, appears on TV chat shows, has a regular spot on Cadena Ser radio and even has time to play the odd gig. A couple of weeks ago I watched him perform at an outdoor venue in Madrid. As he took the stage, he announced: “This is my home!” and the place erupted in applause and the odd cheer. Much of this Rhodes-love can be traced back to an article he wrote in El País in May, entitled: “I have no reason to lie when I tell you that everything is better in Spain”. In it, he sings the praises of his new home and lauds pretty much everything it has to offer: the folksy streets of La Latina, the cheap healthcare, “the unhurried pace of life”, the “delicious” language, the way people insult each other so inventively, and, of course, the croquetas. In one café, he even enjoys the much-maligned Spanish croissant, which in this case “makes you laugh out loud it’s so good”. And he has to be one of the few people in history to deem Spanish TV “gold”. The response to that article was instant and overwhelming. It went viral and grateful madrileños effusively thanked Rhodes for saying positive things about their city. A veteran economist, known for his sober analyses, passed the link to the article around his Whatsapp contacts, telling us: “Nobody should miss this.” Another article followed (singing the praises of the Spanish merienda) and Rhodes has now become a sort of ivory-tinkling advert for Spain, bigging up both its virtues and its clichés. He’s like that super-enthusiastic relative who comes to visit occasionally and who can’t help but say “I love Madrid!” – only he’s here all the time. For those of us who’ve been here longer than a year, it’s all too easy to sneer, I know. And really, I’m not. (After all, the pranksters at El Mundo Today have got there first: “Fascinated by El Valle de los Caídos, James Rhodes writes a defence of Francisco Franco”, read a recent headline on their site.) But I am interested in how such a relationship came about. “I remember when I used to feel like that,” one British friend said to me, wistfully, after reading the aforementioned El País article. Yes, me too. Maybe I never guffawed over my morning croissant, or gawked at the people walking slowly around central Madrid, but, on first spending time in Spain as an 18-year-old, I was wowed by all the obvious things: the lateness, the generosity of tapas helpings, the kids in the bars, the apparently-rude-but-not-really shoutiness, the liberal use of the word coño, the architecture, the well-dressed old men in town squares and much, much more. If I squint, I can remember how those things felt when I first experienced them and many of them still retain their sheen, making it a place I, too, love. Inevitably, perhaps, I can now see some of the downsides of Madrid and Spain, whether it’s dog caca in the street, the price of books or how certain men start a monologue with the words “te voy a decir una cosa…”. The last few months, meanwhile, have brought out the worst side in Spanish (and Catalan) politicians, and the most incredible refusal by many ordinary Spaniards to listen to reason or nuance. Yet that is probably exactly the reason why Rhodes has been embraced so heartily by the city whose bum he squeezes so insistently. Lately, everyone from Catalan separatists and lefty rappers to snide foreign politicians and sniping journalists has been having a go at Spain — and “Madrid”, as shorthand for the country – complaining that it’s backward, repressive, or even run by Nazis. The place’s self-esteem is low. Why else would people feel the need to hang flags from their balconies, wrists and car rear-view mirrors? In the middle of all this Rhodes arrives. He is perfect: not only is he a foreigner, but he’s a famous, young-ish, semi-hip foreigner who swears a lot. Who is going to accuse this dude with the “Bach” t-shirt and the frazzled friendliness of a dope-smoking uni prof of being a fascist? And who cares if he doesn’t know his irregular verbs? As his harrowing and compelling autobiography, Instrumental, makes clear, Rhodes has been plagued by a deep insecurity and a desperate need for approval. Madrid (or even Spain, if you like,) is in a rather similar state. It’s a marriage made in heaven. So, off he goes. Mariano Rajoy, the man nobody could move, Spain’s political pachyderm, has been unseated. During his nearly seven years in power an aura had built up around the Galician: that no matter how bad things got he would survive; that his Jedi-like impassivity would protect him from the tumult all around. Mariano Rajoy: an eight-hour lock-in and a shabby legacy. February 25th is the anniversary of the death of Paco de Lucía, the greatest flamenco guitarist of modern times and, for many, the greatest who ever lived. I wrote the following essay a couple of years ago about Paco de Lucía, the modernist and traditionalist tensions in his music and how that conflict can still be seen in flamenco today. Below is an excerpt; to read the whole thing, click here. Antorrín Heredia stands on one side of the small stage. A stocky, middle-aged man, his black hair tumbles, long and greasy, over his shoulders and his eyes are closed. One hand is holding a walking cane, upon which he is leaning. The other grasps a short metal bar, which he suddenly lifts above his head and swings down onto a blacksmith’s anvil. The noise is surprisingly light and bell-like and Antorrín repeats the action again and again, beating out a complex, stop-start rhythm, before throwing his head back and singing. This is flamenco, but not as most Spaniards know it. Singing a cappella like this – or a palo seco – is a throwback to the music’s 19th-century origins, when those who performed it frequently worked as blacksmiths, or travelling salesmen and even the accompaniment of a guitar was uncommon. It was a time when life was tough for most Spaniards, with poverty, disease and violence to contend with and flamenco music reflected that. The brother-in-law, or cuñado, holds a prominent, yet unenviable, position in Spanish society, transcending the realms of the family tree to become something more than just a relative. He’s a symbol, a social phenomenon, a state of mind. The exact characteristics of the archetypal cuñado are up for debate, but they tend to be negative. He is an extroverted, matey, slightly boorish, know-it-all who greets you effusively but doesn’t really listen to what you have to say. On the contrary, he loudly broadcasts his own opinions, often political, over Christmas dinner. Albert Rivera: first in line in the conga. For many (Maldonado included), Spain’s highest-profile cuñado is Albert Rivera. That’s in great part because in 2016, Podemos leader Pablo Iglesias, in one of those finely calculated moves that he specialises in, cast the leader of Ciudadanos as such during a parliamentary debate. The slightly comic accusation was based on Iglesias’s claim that Rivera’s ideology derived from the same family as the right-wing Popular Party (PP). But there was also a hint of the more personal use of the term – the smug paella-stirrer – which has since stuck to Rivera like rice to a pan. In some ways he does indeed fit the cuñado stereotype, if only in terms of aesthetics and style. There is the clean-cut-but-casual attire, the bumptious self-confidence, the apparent knowledge about any subject and ready response to every problem, which can both impress and grate. But even his critics now have to take Spain’s most popular national party leader seriously. In recent months, Ciudadanos has been riding high in voter intention polls, even proving to be the most popular party in Spain, according to Metroscopia. Rivera, meanwhile, is regarded less and less as a mere opposition upstart who bangs on about corruption and Catalonia and more and more as a potential prime minister. But while that possibility becomes increasingly feasible, the place Ciudadanos occupies on the political spectrum has remained somewhat fuzzy. The brother-in-law, Maldonado explains, with a large dose of irony, “is neither on the left or the right; instead he’s straight up, salt-of-the-earth, genuine.” What Maldonado means is: that’s how he presents himself, although after a few glasses of La Rioja he’ll start on about communism and Eta. Rivera, meanwhile, in a very cuñado-esque bit of rhetoric, told The Economist recently: “We have to move away from the old left-right axis”. Not so long ago, his party was describing itself as “centre-left”, its business-friendliness offset by mostly liberal social policies. But almost exactly a year ago, Ciudadanos redefined its ideology, removing “social democracy” from its statutes, leaving a definition of it as “constitutionalist, liberal, democratic and progressive”, which does little to clarify the issue (after all, who would suggest that being “unconstitutional, illiberal, undemocratic and regressive” was a good idea?). A dig into the archives further muddies matters, with Rivera flip-flopping on gay marriage, opposing abortion as a right, showing an ambivalent take on historical memory, announcing a refusal to support Rajoy as head of a new government in 2015, forming a putative governing pact with the Socialists in 2016, then supporting a new PP government (with Rajoy at its head) a few months later. Confused? Understandably so. But then again, Spanish politics is a weird, many-mirrored place at the moment and similar charges of inconsistency could also be levelled at the Socialists or the Catalan secessionists. But recent events in Catalonia, where Rivera’s party has been hogging the unionist limelight, have, finally, appeared to nail it down as a party of the right. With Rajoy’s PP still mired in a smorgasboard of corruption scandals and having failed to solve the territorial crisis, Ciudadanos has benefitted, winning the Catalan election under the candidacy of Inés Arrimadas and cheerfully surfing the wave of Spanish neo-nationalism. To put it crassly, the Catalan crisis has been kind to Ciudadanos. Conspiracy-prone supporters of independence regularly claim Ciudadanos are right-wing extremists and rabid independentistas tend to portray them as fascist, a term that has lost its currency in this age of the easy insult and which really isn’t relevant in this debate. (One thuggish wag painted “Neo-fachas” on the doorstep of the party in L’Hospitalet de Llobregat recently; one twitter user accused me of receiving funding from Ciudadanos the other day for suggesting in an article that the party was moving away from the PP on the historical memory issue). But no, they are not the crypto-Francoist, goose-stepping loonies their enemies desperately try to portray them as. Yet it does seem that Ciudadanos finds itself in a rum, rather disturbing, position – let’s call it Rivera’s Conundrum. Created as a nationwide force in 2014 with the promise of introducing a centrist, transition-style statesmanship to Spain’s tribal politics, in Catalonia the party has become precisely the opposite, doing as much as any other to rattle the cage of tribalism. The more polarised the territorial crisis has become, the more Ciudadanos has hoovered up anti-independence votes. And it has heartily contributed to that polarisation, positioning itself as yin to Carles Puigdemont’s exiled yang, with the PP often a hapless bystander. One of my favourite cartoons of recent months was a picture of Rivera marching along, bashing a drum marked “Article 155” – the clause in the constitution allowing Madrid to implement direct rule. His insistence throughout much of last year that this drastic measure be introduced often left Rajoy looking timid and, dare I say it, moderate, in comparison. Ciudadanos’s approach to this issue was on display recently in Madrid during a BBC World Questions debate, panelled by representatives of Ciudadanos, the PP, the Catalan Republican Left (ERC) and journalist Ana Romero. The most belligerent voice in the room was not that of the PP’s Francisco Martínez or ERC’s Alfred Bosch. It was Begoña Villacis, of Ciudadanos, whose insistence on attacking the Catalan independence movement at every turn – even, bizarrely, when the debate had moved on to Gibraltar – which gave the event a slightly sour aftertaste. And there are signs that, in its determination to keep stealing voters from the PP, Ciudadanos’s hard-line playing to the gallery is seeping out of Catalonia, into its national politics (see its attempts to remove the Basque government’s historic right to controlling its own taxes, or its U-turn on the issue of life imprisonment). So where does this leave Spain’s best-known brother-in-law? After years of shifting around, and with the corridors of power apparently beckoning, it’s time he made clear where exactly on the political right he and his party stand as a government-in-waiting. Worryingly, Rivera’s Conundrum dictates that if he shows any willingness to step back, to make concessions – to stop banging the drum – he’ll lose votes. Given that Puigdemont’s Conundrum dictates similar terms for the ousted Catalan president, don’t expect to see much bridge-building any time soon. It’s been a funny old year for Podemos. The party began 2017 hobbled by infighting as its two most prominent figures, Pablo Iglesias and Íñigo Errejón, battled for its soul. Iglesias emerged as the winner and his deputy was banished to a lesser role, with Irene Montero taking his place as the party’s parliamentary spokesperson. Amid the sound and fury in Catalonia, Podemos struggled to make itself heard at times this year as it carefully trod a path between unionism and separatism. But in the spring, it did manage to hog the headlines when it presented a no-confidence motion against prime minister Mariano Rajoy. The proposal failed but it allowed the 29-year-old Montero to deliver a withering parliamentary attack on Rajoy and his party and to announce her own arrival as a political player. Although Garbiñe Muguruza only won two tournaments in 2017, the fact that one of them was Wimbledon made this a year to remember for the Caracas-born tennis player. Her high-energy game, built on powerful groundstrokes, helped the 24-year-old beat Venus Williams in straight sets in the final at the All England Club. She also held the world number one ranking (before losing it to Simona Halep) and took a WTA Player of the Year award. “Muguruza should win another Slam in 2018, and maybe even two,” warned Baseline website. With Rafa Nadal back at the pinnacle of the men’s game, it has been a year to celebrate for Spanish tennis. Inés Arrimadas has long been a thorn in the side of the Catalan independence movement. As the Popular Party (PP) and Socialists lost ground in the region, her Ciudadanos party emerged as the leading unionist voice and Arrimadas as an aggressive and effective critic of separatism. But this year, the 36-year-old has been even more in the news, assuming her new dual role as leader of the party in Catalonia and its national spokeswoman with aplomb. Arrimadas ended 2017 by delivering an historic electoral result: she secured 37 seats in the regional chamber, making Ciudadanos the first non-nationalist party ever to come first in a Catalan election. That remarkable result will almost certainly not be enough to make her the new regional premier, but it did highlight how unionist Catalans finally found their voice after a tumultuous few months. Amid all the political histrionics in Catalonia this year, a genuine tragedy did take place in the region: a terrorist rampage along Barcelona’s Ramblas on August 17th, followed by a similar attack in Cambrils the next day, leaving a total of 16 people dead. The official response ranged from the impressive to the petty and to their immense shame, a number of public figures saw the aftermath as an opportunity to advance their political agenda. But in a year when clumsiness and mediocrity was so often on display from national leaders, others showed a remarkable degree of integrity. Among them was Javier Martínez, father of a three-year-old boy, Xavi, who died on the Ramblas in the first terror attack. Just days afterwards, he embraced an imam in the town of Rubí, in a gesture of unity that was as astonishing as it was rational. Long billed as the day the Catalan government would hold its outlawed referendum on independence, October 1st always looked like a day of reckoning for Spain’s territorial crisis. But the vote itself was overshadowed by the behaviour of the national police and civil guard, who were deployed to several polling stations where they proceeded to attack voters and seize ballot boxes. 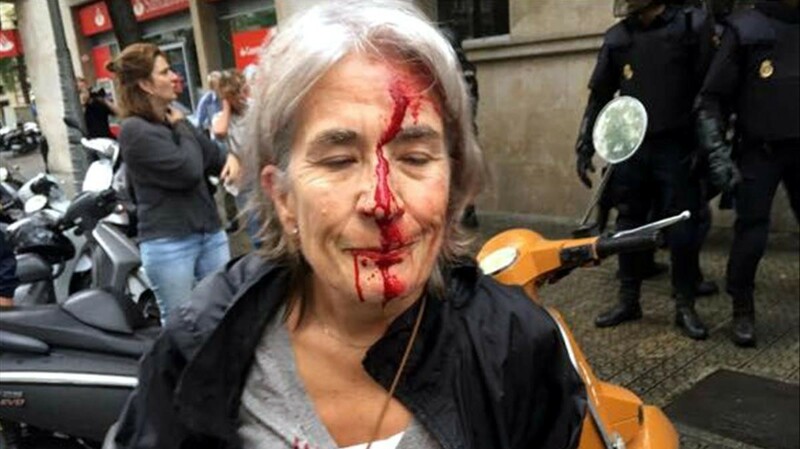 Both sides of this conflict have been guilty at various times of a crass disrespect for democracy, but as footage and pictures of this violence travelled around the world (along with other, fake, footage), it became apparent that this had been a monumental error of judgement by the Spanish state, whose efforts did not even manage to halt the referendum. Catalan separatists were handed another grievance against Spain, one that will no doubt stick in their minds for years to come. I have chosen the (unidentified) woman in this picture as Spain’s person of the year, not because of anything she has consciously set out to do, but because she represents the entrenchment and polarisation that the Catalan dispute has caused and the senseless violence it provoked.